Spending $50 to $75 on a couple you’re not that close to is reasonable, experts say. Q: I’m attending the wedding of a distant cousin, who I barely know. I don’t think we should have to spend more than $50 to $75 on a gift, but my wife says we’ll look like cheap jerks. Who’s right? A: Relax, you’re not cheap jerks. 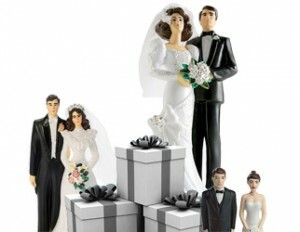 A recent survey of newlyweds by Theknot.com and Weddingchannel.com found out how much guests spend on wedding gifts. On the lower end, $50 to $75 was considered reasonable for a colleague or business associate. Next up were friends or relatives, where the norm was $75 to $100. But if it’s a really close friend or immediate relative, be prepared to shell out $100 to $150. A distant cousin definitely qualifies for the middle range—stick to $75 and you’ll be just fine. Keep in mind that the happy couple’s special day is a celebration of their union, not how much loot they can collect, says etiquette expert and host of MannersTV.com, Louise Fox. Got a delicate money question? Send it to [email protected].